Please note – the first part of this blog post was drafted last week and the second part was drafted today. Please read the whole post. My blog presence has been pretty sleepy over the past few months – which is pretty much a reflection of how I have been. I have been sleeping lots and not feeling very well and struggling to get through work each day. BUT – with good reason! Bill and I have been absolutely blessed beyond words. We are expecting a beautiful baby – due on February 9 next year! We are over the moon and so excited! 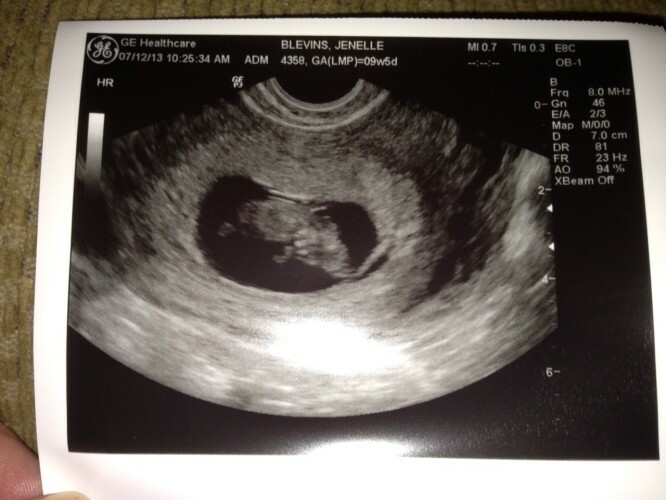 Introducing – Baby Blevins – at 9 weeks! The past couple of months have gone by in a blur of nausea and sleepiness. The best way I can describe it is – you know when you get off a dizzy ride at the Royal Show or State Fair? That bleugh feeling you have for a minute afterwards? That is how I’ve felt the whole time. Like I’ve been on a spinny ride after having eight hot dogs in a row. That non-stop sea sickness feeling. I’ve been sleeping and sleeping and sleeping. My nausea is worse at night but over 4th July it ramped up and has since subsided. It has made working really uncomfortable and dealing with the various ‘New York smells’ I encounter on the way to work has been horrendous. The crazy stuff has been my sense of smell. I can smell anything, anywhere. When we went to see Superman, a guy five rows away from us was eating a hot dog and it was like he was waving the frankfurt under my nose. Also, I’ve totally gone off vegetables. I cannot stand them and, don’t even miss them. Same with salads. Blah! I just want to eat icy poles and oranges and tomatoes all day and I love McDonalds now even more than ever. So much that I actually spent an hour one night googling pictures of Quarter Pounders and have a great hi-res picture of one as my wallpaper. Since the 4th of July, the only meal I feel really fabulous after is Maccas. So I’ve had it a few times to enjoy in feeling ‘normal’ for just a little bit. Also, since five weeks along, Bill has been giving me these horrendous progesterone injections and with constant blood tests, my needle phobia has been well and truly confronted and dealt with. Needles? No problems! All the anticipation and excitement came to a head last Monday as I passed the 12 week mark. We had our Nuchal translucency ultrasound booked. Bill came along for his first time to view Baby Blevins in full action! At first there was some kicking and showing off for the ultrasound but then there was a sleepy break where some tapping on my tummy got the turning happening again. Our sonogram technician was quiet but nothing seemed out of sorts as I was busy ohhing and ahhing at the screen. She went off to show the images to the doctor and I remained laying on the table waiting for them to come back. The next fifteen minutes was a whirlwind. A doctor we never met walked in the room. Our beautiful baby had a defect. No skull. No chance of viability after birth. Fatal condition. We walked the halls back to the labor and delivery wing and waited. And waited. And googled and googled while we waited and waited. 2.5 hours later, still in scrubs, our Doctor was able to see us. After a warning from Bill, I let him say his piece while seeing the booking calendar on his monitor. No doubt to schedule a termination. I can see it now “Oh yes, let me just get out my phone and check iCal to make sure we don’t have a Fresh Direct delivery scheduled!” Sigh. In between more tears and after him explaining there was no hope and a termination can be arranged I asked him – “What would you say if I said I cannot do that?” He looked at Bill to help him out but Bill explained my position. He was compassionate as best as he could and explained that of course, this is not something that had to be decided today. I couldn’t blame him – he hasn’t known me long enough to how steadfast and stubborn I am and how there is hardly ever any ‘grey area’ for me. The concern was all about me and my health. In all my googling, I learnt that carrying an anencephalic baby is no more harmful to a mother than a normal pregnancy. The baby grows pretty much normally in all aspects except for their tiny little brain and skull. For my own mental health and well being, this baby had to stay with us for as long as she is meant to. I would have no part in deciding her fate. She would go on her terms, not ours. We owed her that much. We want to give her as much love as possible in the two minutes or two hours she is with us. This pregnancy is going to progress exactly like a normal pregnancy. The only difference for us is, while we are still having a beautiful baby – we just won’t ever get the chance to bring her home. Yes also, a she. We think our bundle of joy is a little girl as this diagnosis mainly affects girls. We had other names picked, but for this baby we have decided Josephine Martha (as we found out how special she was going to be on St Martha’s day on Monday). If it is a boy, he will be Joseph Martin. We were never going to find out the gender, but we will do so for Joey. So far, we do know that this has just happened ‘just because’. All of my blood tests came back fine, all of the earlier scans were fine, I had been taking full levels of folic acid for over a year. This has nothing to do with my progesterone levels or anything and the chances of this happening again are still low with some extra Folic Acid treatment. Hopefully we will get more answers as the process goes on. 98% of babies are terminated after this diagnosis. Our Joey is already beyond special and now, even more so. On Tuesday, we went to visit my normal doctor who squeezed us in during her lunch hour. She in herself, is amazing. Since this diagnosis, she has recommended a change of doctors and we agreed. Everything is different now and all of three of us need a different kind of care. Next Wednesday, we will be meeting with our new doctor and if she is even half as amazing as what I have read about her and her practice/neonatal hospice at Columbia Presbyterian, the next six months will be just as they were meant to be. I know you will now probably search for information on this. The pictures can be distressing. Please know, a lot of them are extreme anencephaly cases. These babies are beautiful. No doubt, this blog is going to turn into a whole lot of updates on Joey and us and the ups and downs of this time. There will be a lot of them. I hope you stay with us as we create a bucket load of memories and honor Joey as best as we can. Already, she is being overloaded with love and that is as beautiful as her tiny little kicking feet. The feet I cannot wait to pat dry after her bath and then tickle with my nose.